Automated gate systems are a great way to protect gated communities, as well as commercial, industrial, and government installations. 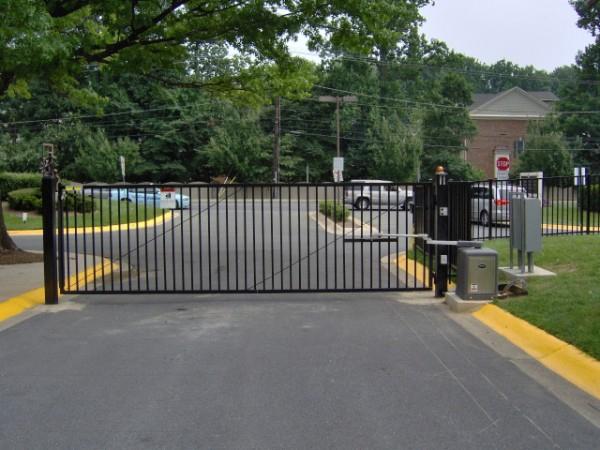 We offer gate operator systems combined with barrier lift gates for maximum security, and multiple entry options including transmitters, pushbutton, touchpad with intercom, dedicated phoneline connection, or swipe card, for convenience. Metal detection loops, photo eyes, and metal detecting gate edges further ensure the gates’ security. We can also add to existing facilities, such as the addition of an operator system at a main entry gate. Contact us for more information on our automated gate system services. This entry was posted on Friday, October 18th, 2013 at 8:33 pm. Both comments and pings are currently closed.